Bumili ka ng Negosyo ngayong Disyembre! Negosyo! Negosyo kayo diyan! Bakit namin nasabi na "Bumili kayo ng Negosyo?" Negosyo? Binibili ang Negosyo? E 'di ba pang mayaman yun? Sure kayo? May tinatawag na Franchising kung saan kahit na sino ay pwede magmay-ari ng sariling bisnes. Maigi ito lalo na kung ikaw ay isang OFW na nagbabakasyon sa bansa at gusto na mabigyan ng halaga ang pinag-iipunang sweldo. Maraming uri ng mga franchises ngayon sa merkado, gaya ng sa food and services sector. 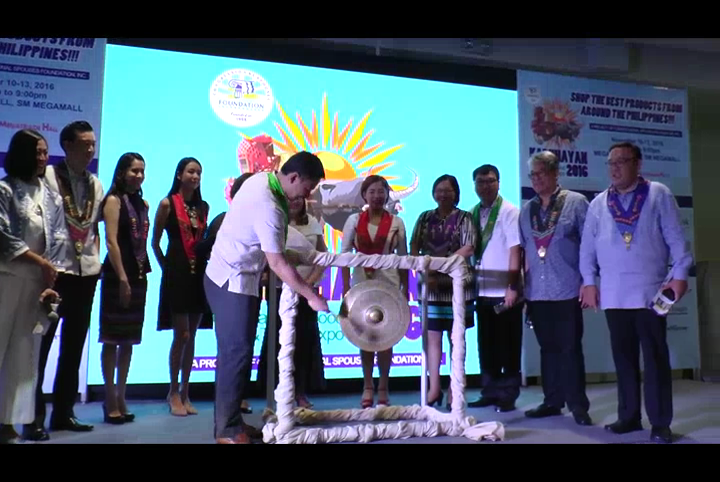 Sa pag-invest sa mga franchised na business, maari kayong tulungan na maghanap ng pwesto, ituro sa inyo ang paraan kung paano patatakbuhin ang nakuhang negosyo, at mapapabilang kayo sa branches ng nasabing franchise na may kinikilalang pangalan. 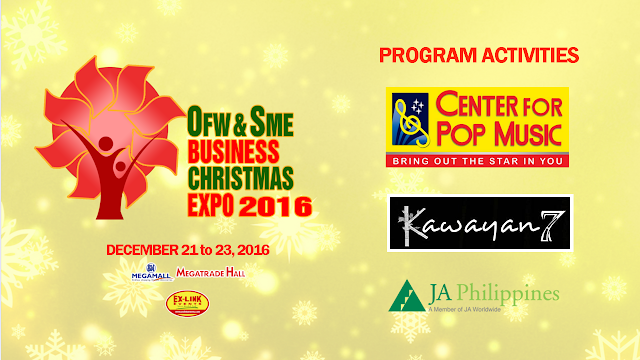 Sa OFW & SME Business Christmas Expo sa Megatrade Hall 2 ng SM Megamall ngayong December 21 to 23, Wednesday to Friday, tampok ang ilang mga franchise opportunities na abot-kaya ninyo, kaya magsimula nang bumili ng sarili ninyong bisnes! Minsan lang ito sa isang taon, kaya wag na magpatumpik-tumpik at pumunta na! Para sa iba pang impormasyon, tumwag sa (02) 643 3887 o mag-ext sa 0920-924-2532 o 0920-981-4376 o mag-email sa info@exlinkevents.com. 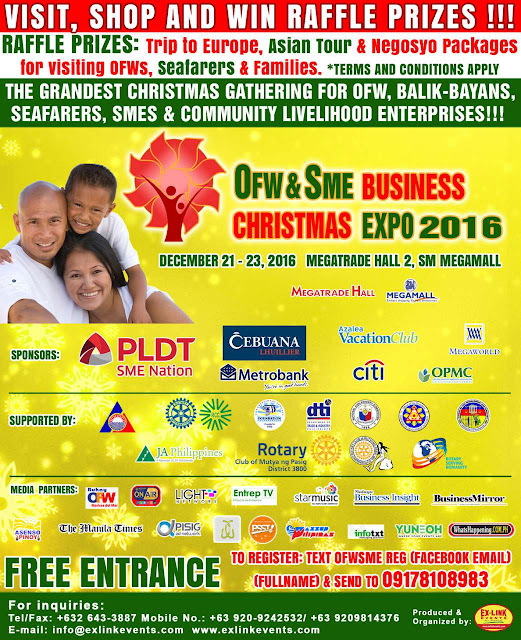 Calling all OFWs, Seafarers and Families: Get a chance to win prizes by visiting the OFW & SME Business Christmas Expo just before the Christmas weekend. 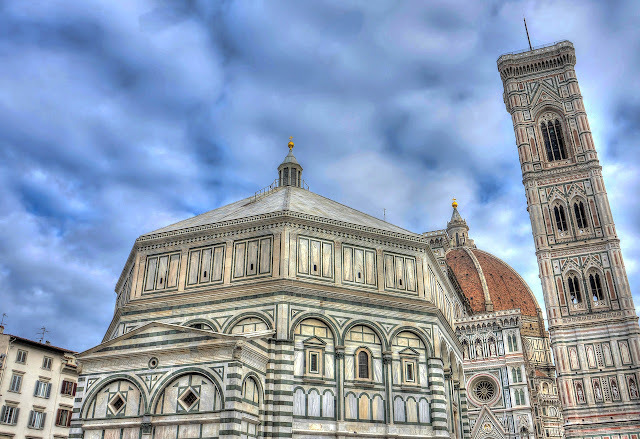 Aside from Negosyo Packages, trips to Europe and Asia are up for grabs - to register in the raffle, text OFWSME<space>REG<space>Facebook Email<space>Full Name and send to 0917-810-8983. Terms and conditions apply. 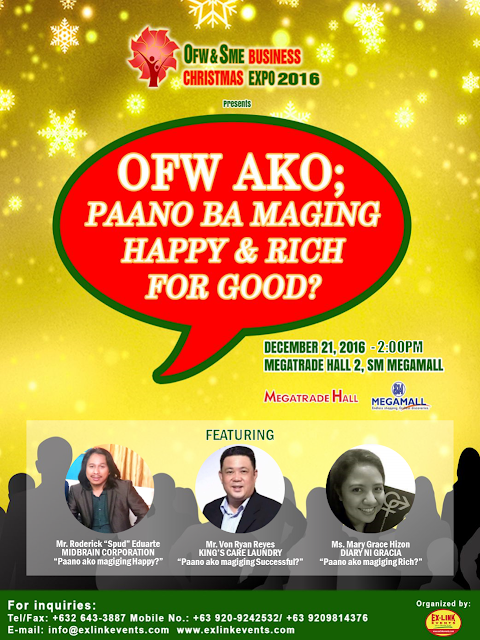 Beyond the prizes up for grabs, there are lots of activities in store for everyone, such as the "OFW Ako; Paano ako magiging Happy and Rich for Good?" talks (Day 1), student pitching competition by Junior Achievement of the Philippines, Inc. (Day 2), a showcase of Bamboo-made Products (all days) and performances by the Center for Pop Music Philippines (Days 1 and 3). Company Christmas Parties are a much-awaited event. It is the season of giving, a break from the stress of the work, a chance to see the human side of your boss and coworkers (if you can’t see it during the daily grind in the office). If ever you are assigned to be the leader of your company Christmas party, I know that you will agree that you wanted it perfect and memorable. But horror stories have been recorded when someone that lack event management skills were given the task to organize the company Christmas party. But don’t be afraid, help is here. Here are 5 must know event management elements that you should know in order to execute a memorable and successful company Christmas party. If you know how much is the allocated budget or financial resource for your company Christmas party, you can start with your vision of your party. Often times, the vision for the Christmas party is wasted because it is so grand, but when the budget allotment was declared, it cannot or it is difficult to even accomplish 50% of the items created to implement the vision. My mantra here is the: Your Budget makes the Event Vision Realistic. My event company is known in many things, and one of the things that we are known for is when we set the date, we stick to the date. Oftentimes, a lot of corporate event management planners forget to set the date of the Christmas party. It has a lot of negative consequences. Among the consequences are unavailability of the venue, late information dissemination among employees of the Christmas party paving the way for poor attendance, poor logistic preparations because there is no date to target the required work to be finished in order to set up a great Christmas party. My mantra here: There is no turning back when the date is set. If your Christmas party is in your office, the problem is minimal. But if you are planning to have your Christmas party outside of your office, finalizing your venue is a must. Remember, you are not the only company that is eyeing to use the preferred venue that you have in mind. So get this out of your obstacles, act fast, set the venue and relax. 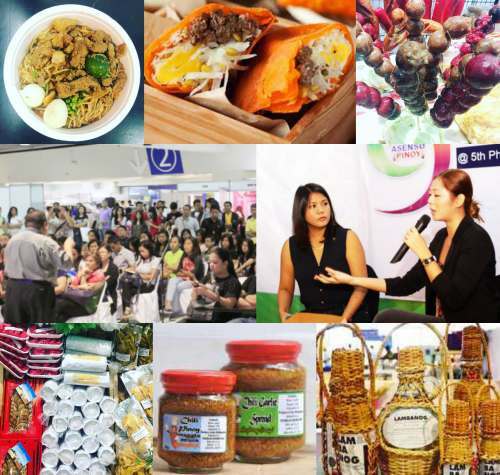 We Filipinos love food so much. In addition, there are indications that Filipinos will judge the success of the event they attended by judging how it satisfied their palette and stomach. You do not need expensive food to achieve success. What you need is delicious food and abundant food that will elicit a positive reaction among your peers. My mantra here is: Abundant Food Means Successful Christmas Party. Let creativity color your Christmas party by creating an event theme that will make the attendees experience magical and fantastic. This is the ingredient that adds color to your Christmas party. It makes your party unique and an event worthy of their time. Most of the time, the theme brings out the best in the attendees, because it creates excitement. 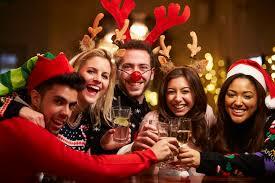 It automatically communicates with the attendees that your Christmas party is fun. A themed Christmas party that is successful this year makes your attendees crave and look forward to what is in store in the coming Christmas party next year. In summary: this is not an exhaustive discussion of the elements needed to make your event management responsibilities in implementing your company Christmas party successful. But putting this into heart and giving these elements special focus will assure you of your Christmas party’s success. So put on your event management hat and start creating one fabulous Christmas party for your company. Bubi Trampolines are starting to be seen in various malls in the metro, and they are also now in Cebu, but they need nore partners to spread fun to kids and parents in the country - now is the time to get a Bubi Trampoline franchise! Megaworld Corporation has been building townships in the country, and here in Cebu, they have the Mactan New Town area, where you can get your own condo. Visit their booth to know more. If you're into flats, Bria Homes has the best match for you - Bria Flats in Mactan. Steel Art Billboards also has their booth inside - know more about their out-of-home advertising services! Looking forward to have a card printing business? Come to the AllCard booth and know more about their solutions! We also have resource speakers that are eager to share to everyone the basics of Social Media, Email Marketing and Effective Selling Strategies, so get your friends and let's gather at the Cebu Trade Hall of SM City Cebu this weekend!